Whether you are in need of repairs for small appliances like coffee makers, microwave ovens, humidifiers or major appliances like washing machines, dryers, and refrigerators, finding an excellent Phoenix appliance repair services can be difficult. 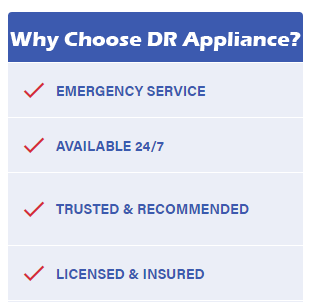 DR Appliance is an efficient appliance repair service in Phoenix that offers you a range of service and is committed to giving you the best quality of work you can find. DR Appliance carries out residential and commercial appliance repair services for your kitchen, laundry, and other general machine parts. Whether you run a restaurant or just want to maintain your home kitchen at an optimal level, things like refrigerator leaks, washer breakdowns or general appliance damage can affect your residential or commercial activities. We offer you a range of services that fix these problems quickly and efficiently including dryer repair, refrigerator repair, freezer repair, washer repair, dishwasher repair, AC repair, oven repair, microwave oven repair and more services. Why hire a professional appliance repair service? It saves you money: Appliance repair when done by a professional will save you more money than buying new equipment. At the end of the day, your device may be suffering from a slight issue that will cost you little to fix. Quality repairs will also extend the lifespan of your appliances. It’s quicker: unlike do it yourself videos, which make repairs look so simple, fixing your appliance yourself can be hectic and time wasting, especially when you are on a tight schedule from personal or business responsibilities. Hiring expert services will provide you with a team of qualified and experienced technicians that will get the Job done quickly and efficiently. It’s safer: Today's appliances have become more technologically advanced making them more intricate and complicated to fix. As a result trying to repair the problem yourself can put you in danger of electrocution or damage your electrical unit, compounding the initial problem. Unless you have solid knowledge on technical repairs at large, it is a lot safer if you employ the help of professional appliance repair services. It is less stressful: A significant upside to hiring outside help is the pleasure of knowing that things are getting done without you exerting unnecessary energy. An excellent repair service will carry out your repairs as desired while you get busy with other productive or relaxing activities; essentially speaking you remain stress-free. Improves maintenance: A professional service will address your questions appropriately and explain fully the problems your appliance has. At the same time, an expert technician will give you tips and advice on how to properly maintain your appliance to avoid future issues. This way you will not only get your item fixed, but you will also understand what can cause problems and how to avoid it, increasing the lifespan of your appliance. Punctual: We understand how frustrating it can be to wait for a repair technician who shows up late, delaying you for hours and halting your personal and professional tasks. For that reason, we take it upon ourselves to ensure that the repair technicians we provide you with are punctual, and will show up for appointments as scheduled. Professionalism: No need to worry about a rugged, gruff looking or unprofessional service personnel showing up at your door. Our workers are always professional and will create a comfortable and personalized atmosphere. Our technicians are also smart looking, in clean and crisp looking uniforms. Courteous: We are committed to providing you with a team that is polite and respectful. You can expect workers that will respect your home, and carry out repairs without leaving behind a mess for you to clean up. Your questions and concerns will also be adequately addressed without rudeness or inconsideration. Expertise: We guarantee you technicians that are experts with continually increasing knowledge on how best to repair your appliance. We will also carry out your job as quickly as required, with just as much efficiency. Access: Hiring our services will also provide you with access to several appliance parts that may otherwise be challenging and stressful to find. We will ensure that you get the best quality parts for your appliances, and will provide alternate parts if the brand of your item is out of business. Affordable prices: You no longer have to pay exorbitant fees to keep your home and business running in proper order. We offer our services at affordable prices without sacrificing the quality of the job itself. Dedication to customer satisfaction: Our strength at DR Appliance is our complete devotion to ensuring that our clients are completely satisfied with the services that they get. This is one of the reasons DR Appliance is your best choice for quality appliance repair services in Phoenix. There is, therefore, no need for you to settle for less than standard. Knowing how much you rely on your appliances for your everyday home and business operations, our services are easy to schedule and aim to provide you with fast, efficient and detail-oriented repairs that will get your appliances working in the best conditions again.